Washington D.C. (July 30, 2015) – Advocates behind the viral campaign “Operation: #FaxBigBrother” today announced that concerned Internet users have generated more than 6.1 million facsimiles opposing S. 754, the Cybersecurity Information Sharing Act (CISA.) The faxes, sent because Congress is “stuck in 1984,” will be constantly flooding into U.S. Senate offices in the coming days, encouraging members to vote against a bill that experts say will fail to prevent cyber attacks like the OPM hacks and allow for exponentially more government surveillance. Leadership previously made clear their intent to pass the bill before the summer work period. After intense opposition during the week of action, that is no longer certain. Also this week, a letter in opposition to CISA was signed by 68 organizations and security researchers, and dozens of groups have written blogs and public statements, collated at www.stopcyberspying.com. 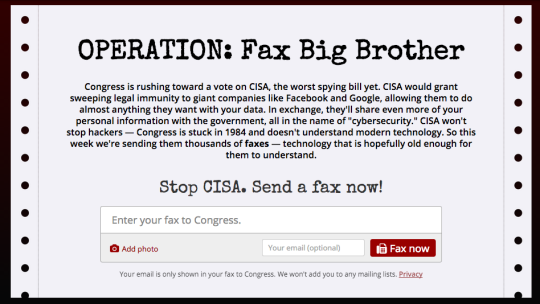 “With millions of faxes queued up to be sent to Congress, there is clearly an incredible amount of opposition to CISA. The Senate ought to take this sign into consideration when deciding on whether to proceed with CISA. Otherwise there’s likely to be a paper shortage on the Hill shortly,” said Ryan Hagemann, Civil Liberties Policy Analyst at the Niskanen Center. “Civil libertarians finally figured out that we needed to speak to Congress at their technical level – so we’ve sent them 6 million faxes explaining why their cybersecurity ideas are antiquated and their lack of technological acumen so remarkably dangerous,” stated Sascha Meinrath, Director of X-Lab. The Operation: #FaxBigBrother week of action was organized by Fight for the Future, Access, and the Electronic Frontier Foundation, with support from a dozen diverse privacy and civil liberties groups including the ACLU, American Library Association, National Association of Criminal Defense Lawyers, Freedom of the Press Foundation, Constitution Project. Association of Research Libraries, Niskanen Center, Free Press, The X-Lab, Sunlight Foundation, and Media Alliance.